Hayley Gallery brings a new and exciting exhibit to the gallery on a monthly basis featuring a wide range of artists and mediums. Artist opening receptions are FREE to attend (ages 12 and up please). Lisa practiced architecture for many years before becoming a glass bead artisan. This influence can be seen in the bold colors and platonic forms of her work, redefining the traditional round glass bead. She crafts all of her beads by hand in her studio. The beads are the foundation of her unique jewelry designs that draw inspiration from a broad variety of influences from the retro patterns of the 1950’s to the organic forms of branches and stones. She has won many awards at local art shows and been featured in several newspaper articles highlighting her work. She lives in Cincinnati Ohio with her husband and son and jokes that playing with fire is the favorite part of her day. JoAnn started her career selling and designing scientific borosilicate glassware for the educational and research arena and began the artistic side of glass about 7 years ago. She has studied with the top names in kiln formed glass across the nation. Each workshop gave her new skills and information to continue the evolution of her work. Glass frit design is similar to the impressionist paintings. If you look closely at the artwork, you can see tiny points of color. When you move five feet or more away from the piece, a more cohesive picture is developed for the viewer. JoAnn wishes to move that viewer either with memories or just the beauty of the artwork itself. Bob studied photography and drawing at the Columbus School of Art and Design. That facilitated his transition into painting, which have sold internationally. About 7 years ago he and his wife, JoAnn, started a journey in kiln formed glass art. He loves the simplicity of color and shape to form a design of organic still-life. The technical aspect of glass and heat is a continual learning curve that helps propel his art in new directions. At the age of 53, Sue Corbin left her life as a successful business executive and leader in two industries to raise a newborn granddaughter. The transition from non-stop meetings and travel to a sedentary life was a bit challenging so Sue decided to take jewelry making classes. By the second class, she felt that she knew more than her teacher and walked away to develop her own style. Sue always loved and purchased one-of-a-kind artwork throughout her life, so she had an affinity for the unique. Unbeknownst to her, the talent she observed and acquired from her gifted, prodigy mother came to the surface as she created jewelry for herself. When strangers approached her and complimented her jewelry, she realized she had a gift. Although Sue is eclectic in many ways in her designs she favors symmetry. She creates simple designs as well as unique pieces using natural gemstones that inspire her. She only designs jewelry that she loves and fortunately for her, many others love her designs. Her background in sales and marketing led her to walk into a gallery in 2007 to see if her creations had merit and her career as a professional jewelry designer began. She was the permanent artist in several galleries in Ohio for the past 9 years and interestingly enough, she is back in the gallery that first accepted her jewelry in 2009, Hayley Gallery. Long before creating commercially successful art, Lora brought artistry to everything she did. During the years she brought up her family, she worked as a face-painter at art fairs, turned her homes and gardens into showcases of unique color and ideas, she made bird houses and furniture from natural materials, she studied and perfected skills in wood-working, upholstery, painting, pottery and tile and experimented with the use of multiple mediums and styles. She became an expert in tools and materials. Her most impressive skill though is turning old timepieces into beautiful jewelry. destination is the person wearing and enjoying my jewelry. My process begins by hand drawing intricate designs on a small piece of flattened metal. The metal is then carefully acid etched to reveal a tactile, graphic pattern. My hope is that the person wearing my jewelry will feel as unique and beautiful as the design that is individually etched on each piece. Art is a part of who I am. Painting has always been my first passion followed closely by photography. For over twenty years, I have been creating works of art in both mediums, and I strive to become a better artist with each new painting and each new photograph. Over the last few years I have begun to infuse parts of each medium to create abstract paintings based on images found in nature. I never try to recreate exactly what I see, but to express the feelings I get from a scene. My goal is to portray the atmospheric qualities of a scene without giving away every detail. When I show a piece I want the viewer to connect with the painting by adding their own feelings to it as well. I want it to remind them of something familiar. This makes it more of a personal experience for them. When I look at my work I want to be reminded of what originally inspired me about it. Whether it was late day sun creating long shadows over a field or simply the way a group of elements work together, if I look at the painting and get that same feeling, I have accomplished my goal. Jewelry, as an art form, has the power to create moods, provoke opinions and produce reactions. At her studio. this is the design philosophy that New York based jewelry designer Catherina Bishopp follows in creating and developing her own unique collection of jewelry. Although she uses precious stones and metals in her work, the design is of much greater importance to Catherina than the intrinsic value of the materials she works with. Her ultimate goal is evoking humor, whimsy and rare imagination through the use of striking color and inventive design in each of her pieces, which is what gives Catherina her signature look. Catherina has lived and worked in New York City, Los Angeles, Miami, The Netherlands, France, UK, Trinidad and Tobago, and now in Columbus, Ohio. This close view of other cultures and people gives Catherina a diverse perspective on her own designs and a greater appreciation of other artists' abilities. Today, Catherina continues to be inspired by this experience as she brings her special touch to the creation of memorable jewelry which compliments a woman's beauty. Colors vary. Call Gallery for more information. Terri has a B.S in Fashion Merchandising and Design from the University of Illinois at Urbana- Champaign and spent a number of years in the fashion world on both the design and manufacturing sides of the business. After many years of being a stay-at-home-Mom, Terri decided to head back to the drawing board and resume classes. She got side tracked along the way by the exciting new world of Precious Metal Clay. 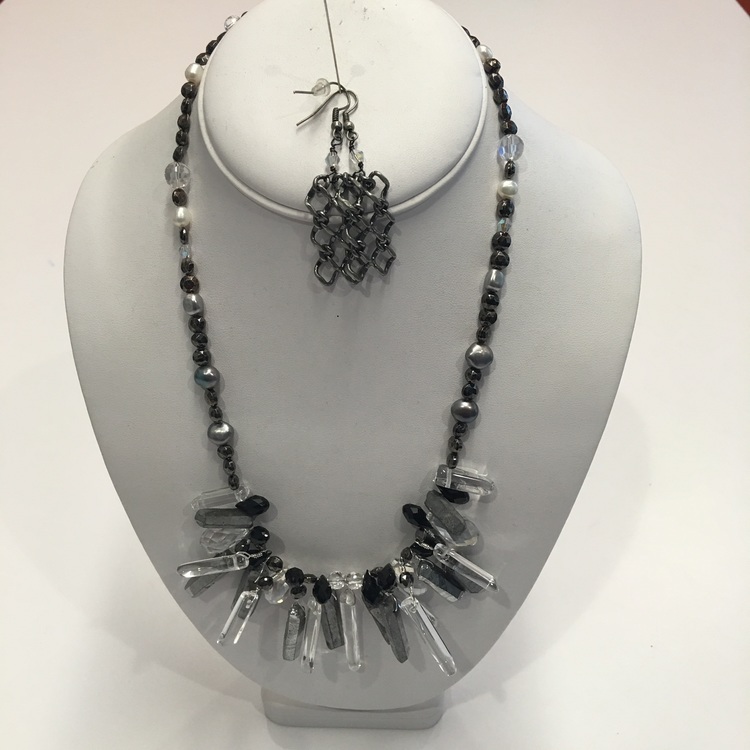 Always a lover of jewelry, she immediately recognized how easily her design skills could merge with the properties of metal clay and her jewelry career was off and running. Now a certified metal clay artist, her jewelry has branched out in several directions to include chain maille, dichroic glass and traditional metal work. Art for Life helps raise awareness and significant funds for ARC Ohio’s (a division of Equitas Health) HIV/AIDS medical care, support, prevention, education, testing and advocacy services. The majority of the of the funds raised at this year's 2016 Art for Life event on September 24 will continue to support ARC Ohio with a portion of the art sales to benefit the Pizzuti Collection’s educational programs. Beverages and light bites will be served. Hayley Gallery will be on vacation! Our staff will be on vacation, the gallery will be closed July 2nd to July 11. What better day than Mother's Day to show her some love with a one-of-a-kind piece of jewelry? We have invited our favorite local jewelry artists to each have a trunk show in the weeks prior to Mother's Day - Sunday, May 8. My name is Jennifer and I love to create unique and beautiful things. Having majored in Art History, I have always been drawn to colors and form which led to my creative outlet as a jewelry designer. I am excited to be showing my pieces with Hayley Gallery. For the 3rd year in a row, we are proud to be showcasing the amazing artwork of NEW ALBANY HIGH SCHOOL students at an Opening Reception on Feb. 20 from 5 to 8 PM. Please mark your calendar and show your support for these talented teens. Artist Jurate Phillips "Inspired Reminiscence"
Jurate Phillips (pronounced: You-ra-te) grew up in Soviet occupied Lithuania. From her earliest memories she has studied art and developed her talents in that field. She graduated from Siauliu Universitetas, in Lithuania (1996), where she was classically trained in painting and design. She came to the United States in 1997 where she has since graduated from Columbus College of Art and Design (2002). She now resides in Columbus, Ohio with her husband and daughter. Since her earliest days her passion has been for art in all forms. Jurate has partaken in the creation of many pieces from photography, to painting and sculpture. Her work can be found all over the world in both residential and commercial settings. After working as an interior designer, freelance artist and teaching art she has returned to her first love, which is painting. She now focuses on painting regularly and exhibiting her work. She credits most of her aesthetics to her maternal Grandmother, with whom she spent most of her summers. The natural beauty that surrounded her on her grandmothers farm has influenced the size, scope and subject matter ever since. Her emotions dictate to her what she will paint. One day she will do a landscape, another an abstract, or she might be inspired by a simple flower bloom.